I know its been awhile since I posted but man, life has been hectic. But I've had the past few days to reflect on the weekend where we went to Believe. For th ose who aren't familiar with it - Believe is a Christian based Jr. High Conference. This year, we took 21 kids with us! It was FANTASTIC to see our little church fill up 2 full rows of seats. I have to say, I was worried starting out. All the leaders were under some serious Spiritual Warfare & even the day before, I had a fever & wasn't sure I was going to make it. I couldnt even get out of bed. When I woke up on Friday - my fever was gone! Ryan had actually called me like 5 minutes after I woke up & asked how I was feeling - he said he was awake praying for me since 6:00 am & he was anxious to see what the latest was. I know others were praying as well & they were answered! Thank you Lord! So some bad drama with a rental van - we were on our way! Now, I have never drove anything bigger than my old Ford Explorer - & here I was behind the wheel of a HUGE extended van. I must say - I took it like a pro! Even parallel park ed that baby in Cincinnati - who rocks? Oh yeah! The event - WOW! The theme this year was on Moses & "Connect" - the different ways we can connect to God & to each other - it was pretty powerful! One of the cool things - there was an artist there that would start painting these amazing pictures before each session to reflect what we were talking about. 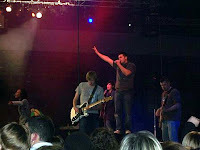 Man - its so cool to see someone use their talents to Praise God. If you are by the Jr. High Trailer - we got some copies of some of the prints - come see them - they are just amazing. The worship is always such a big part of Believe for the kids too. 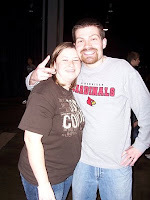 We had the best time rocking out to some fantastic artist. Its just so fun to get in the midst of all these other kids (& big kids like myself) & j ump & clap & scream & dance - all the while keeping God the focus. 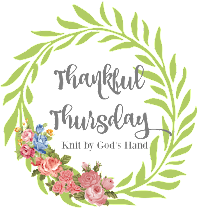 It's just a freeing thing - to be able to worship in a way that holds no constrictions. By the last session, kids that are normally quite & stay to themselves were up there clapping & dancing along with the rest - so much fun! 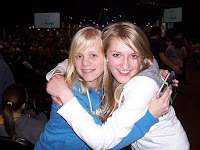 There were stations available to visit in between sessions & small group times that were just great. They encouraged you to connect with God in different ways. There was a station where they had pictures of kids from Romania. You took paper & envelope & wrote a note to them. Then you put a sticker with their face on it & put it on the front so they knew who the letter was to. You then got a sticker with their face to keep so you can continue to pray for these orphans. A little bit of their stories were posted. The child I picked was Nati - I picked her because in her picture - she was laughing, combing her hair - & you could tell - she KNEW she was a Princess! Oh, how sweet her little smile was. If I could - I'd go pick her up right now & bring her home to live with me. It was great seeing these jr. high kids write letters of encouragement & prayers to these sweethearts across the world. I pray the letters are a blessing to them. 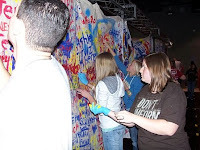 One of the most fun stations we visited - there was a HUGE piece of tarp where you could go paint & leave your mark. We gathered a little gang & went & painted together. It was cool watching everyone leave their own personal "mark". 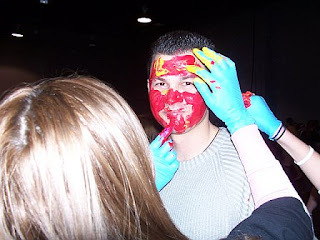 Then, it turned all ugly - Ryan got bombarded by the girls & they found his face more of a fun thing to paint than the tarp. Luckily, he was a good sport about it. What's so funny - after his face is all red & yellow, he's walking around & people just sort of glance, but dont think anything of a 22 year old man walking around with his face completely painted! That's what's so great about Believe! The best part of the trip for me - the focus on God - & man, these kids were focused! During one point of the afternoon session - we were worshipping to some awesome music & they asked us to drop to our knees. This may have taken some out of their comfort level - but all the kids dropped to their knees. And it wasn't just our group of kids - it was all 5,000 kids on their knees that was an amazing sight. I just bawled my eyes out! Then to see these kids raise their hands up to Heaven & sing & cry - they truly felt the Holy Spirit that was moving in the room. It was a moment I will never forget. A visual that I wish everyone could witness - it would truly move your heart to see! As with all good things - it had to come to an end - & after getting only 3 hrs sleep the night before - we drove back to Greenville. It was great because we had 7 kids who made a decision for Christ - whether it be a rededication, trusting more, loving more - connecting more - it was a movement to get closer to God. 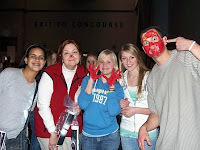 Then it didn't end - we met up for Sunday service & I have never seen these kids so fired up for God in my life! The message at our church could NOT have been more perfect for the moment! It was about worshipping freely & with unabandonment! Oh my - we were up in front of the church showing what we just did the whole weekend. We were clapping, jumping, dancing, praising God the only way we knew how - it was the most amazing feeling. We then moved our class to our trailer & I tell you - I have never felt so much interest & movement in our place as this day. Ryan & Joe were digging in the Bible & the scripture was flowing!!! And even better - the kids were hanging the whole time - pages flipping - the connecting of the whole week was coming together. I can't even put into words the emotion that was going on! It was pretty amazing too - during all of this - it was POURING - I mean, raining like a monsoon outside! We're in a trailer too so you could really hear it pounding on the metal. We were running over on time & we said it didn't matter - the Spirit was moving so we were pressing on. Finally, after being about 20 minutes late - we started to wrap it up - all the while, the rain is still pressing down on us. We had our Elder circle up with us & he prayed for the youth & prayed for us to stay dry as we left - said Amen - & I still can't believe it - as SOON as he said Amen - the rain stopped! We all just raised our heads & looked at each other. Someone ran & opened the door - the sun started peaking out!!!!! We all just stared in amazement! If that wasn't proof God wasn't with us, listening to us - I'll never know what else could make someone Believe! And now, I get to baptize one of my girls next week. I'm so excited, thrilled & honored to be able to baptize her into the family of Christ. I think decisions were made that we may never really know about too - so this is so cool to see a decision that was made being shown to the church. I truly couldn't have been blessed more this weekend than I was. I think the kids enjoyed themselves, learned alot, let friendships grow with all the leaders & each other - & most importantly, grew closer to God! We are all so excited & anxious now for next year! 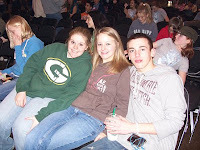 I am so glad that Kayla and the rest of the jr. high youth at GCC have you and Ryan and Joe and Erica to lead them! Kayla loves coming to church! It is a mother's dream! You guys provide a wonderful environment in which she can plant her roots & grow spiritually. I cannot thank you guys enough for your obedience in Christ and your love and enthusiasm for these kids! The way you all consistently pour into them is awesome! I love you guys!